SALT STREET PRODUCTIONS make bold and exciting films about action sports. Through a combination of unexpected locations, talented athletes and the will to turn imagination into reality, we produce films that feel distinctive and fresh. Based in the heart of Sheffield we are part of a thriving sporting community and work collaboratively with others to realise projects of ambition, scale and energy. We have worked with Red Bull, DJI Global, and Channel 4, as well as maintaining our strong links with Sheffield through Sheffield Adventure Film Festival (Salt Street produces the trailer), The Outdoor City, and viral film LOW LINE (wakeboarding in Victorian storm drains under the city). We specialise in reaching a young demographic and our most successful films have exceeded 10 million views. Salt Street was named after the street where we shot our first skateboarding film. Since then we have had huge success, breaking the internet with our viral short films such as Red Run and Low Line. 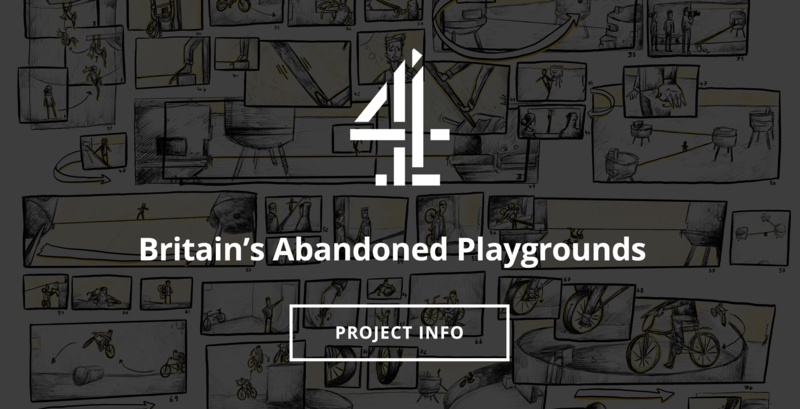 Our first television commission Britain’s Abandoned Playgrounds, is a six part series for Channel 4/All4 in which a crew of skilled young urban athletes travel the UK breathing new life into derelict locations. Our incredible crew includes athletes and artists, photographers, cinematographers, editors and drone operators. We have worked with some of the biggest athletes and companies in sport and the corporate world. We are open for commissions and sponsorship. If you have an exciting new idea, let’s make it into a smash hit. We look forward to hearing from you. Britain’s Abandoned Playgrounds – Trailer	A crew of highly skilled urban athletes are travelling the UK on a mission to breathe new life into derelict locations with some epic stunts. SHAFF 2017 Trailer | Sheffield Adventure Film Festival	Sheffield's celebrated annual adventure film festival returns to the Showroom Cinema from 17 - 19 March as part of The Outdoor City Weekender. Red Run	We took two skiers and one boarder back to the charred remains of Sheffield's dry ski slope where they learned to ski. Red Sands	Pro skateboarder Ben Grove takes his board to skate in one of the most incredible abandoned locations in the world. Low Line	We took two of Sheffield's wakeboarders beneath Sheffield's surface to explore victorian built storm drains. Frost Gun Freestyle	Frost Gun is the only Platinum level Big Air in Europe, a contest on the same level as the X Games and a jump even bigger than last year’s monster that measured 14m tall and had a 30m gap. Red Bull – Harbour Beach	Salt Street took 3 wake borders Fred Carter, Matt Crowhurst, Louis Floyd and Red Bull to test out the most difficult feature in the most challenging wake boarding compaction ever. Red Bull Harbour Beach 2015. This is Our Sheffield	#OurSheffield is all about you – the people of Sheffield, and we want you to get involved once again by making your own short films of what you love about our city. Spirit of a Nation	12 WW2 Spitfire came together in the north of Britain at Humberside airfield. At salt street we pride ourselves on our original concepts, specialising in unique locations and untold stories. We have extremely high production standards using 4K and higher video equipment for all our ground and aerial equipment. We do all our post Productions in house using industry standard software – Premiere Pro and special effects with After Effects. Marketing a film a crucial step in our companies film production. We’ve had huge success in all three sections of marketing. I am the director and founder of Salt Street. Having grown up in the outdoors in woods, streams and snow the natural progression was to work in adventure. I work to the simple rule, if you don’t back yourself, no one will back you. I wear many hats at Salt Street, such as helping in the initial creative process, research, liaising, general organisation, time keeping and much more. I am the Head of Production at Salt Street. I’m an ultra trail runner, climber and writer from Sheffield. My role at Salt Street combines everything I love, adventure, creativity, and the outdoors. Talk to us if you’d like to discuss a concept, idea or story. Or email us if you want to become a Salter and join the team.